Mobil has developed a separate Optimum Performance Oil for each. Why not? Because, with rare exceptions, the marine oil being used wasn't formulated to meet the specific requirements of your engine. Instead, it's a compromise, an oil formulated to meet some of the requirements of the three major makes of diesels used in the United States inland water- way marine trade. EMD. Mobilmar* 300 for the Caterpillar Mobilmar" 100 for the Detroit Diesel. Optimum Performance Mobilgard 450 for the EMD engine. Mobil advanced lubrication technology can sig- nificantly lengthen engine life and reduce oil con- sumption. Because, compared with leading 13 and 17 TBN level competitive oils, Mobilgard 450 provides an 18%-22% saving in oil consumption, 51%-72% better oxidation stability and oil life, and up to 33% better varnish and carbon control. Additionally it increases load-carrying capability up to 20%. In actual service, Mobilgard 450's high TBN level provides alkalinity retention surpassing that of competitive 13 and 17 TBN level products. Optimum Performance Mobilmar 300 Series for the Caterpillar engine. Mobilmar 300 is a high-ash zinc-containing oil formulated specifically to withstand the un- usually heavy stresses placed on lubricants used in high-temperature, low-oil-consumption, 4-cycle, highly turbocharged Caterpillar engines. 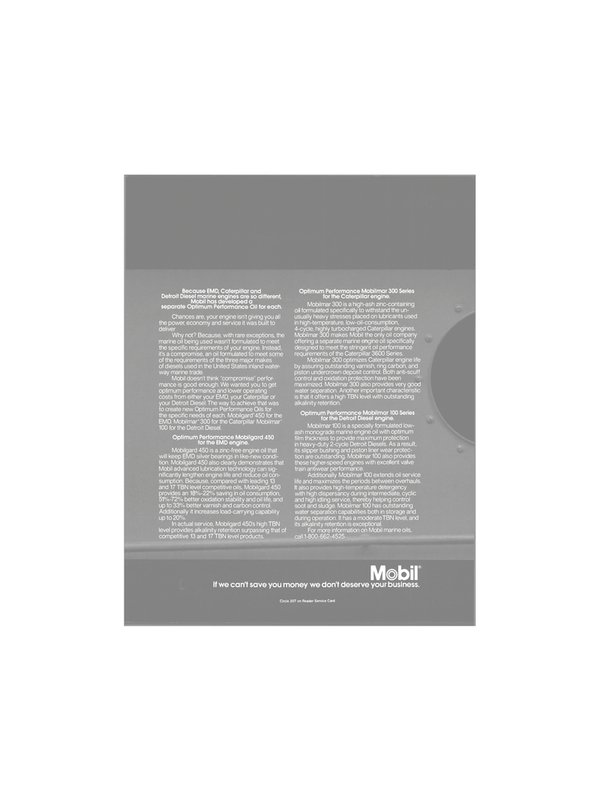 Mobilmar 300 makes Mobil the only oil company offering a separate marine engine oil specifically designed to meet the stringent oil performance requirements of the Caterpillar 3600 Series. Mobilmar 300 optimizes Caterpillar engine life by assuring outstanding varnish, ring carbon, and piston undercrown deposit control. Both anti-scuff control and oxidation protection have been maximized. Mobilmar 300 also provides very good water separation. Another important characteristic is that it offers a high TBN level with outstanding alkalinity retention. Optimum Performance Mobilmar 100 Series for the Detroit Diesel engine. Mobilmar 100 is a specially formulated low- ash monograde marine engine oil with optimum film thickness to provide maximum protection in heavy-duty 2-cycle Detroit Diesels. As a result, its slipper bushing and piston liner wear protec- tion are outstanding. Mobilmar 100 also provides these higher-speed engines with excellent valve train antiwear performance. Additionally Mobilmar 100 extends oil service life and maximizes the periods between overhauls. It also provides high-temperature detergency with high dispersancy during intermediate, cyclic and high idling service, thereby helping control soot and sludge. Mobilmar 100 has outstanding water separation capabilities both in storage and during operation. It has a moderate TBN level, and its alkalinity retention is exceptional. For more information on Mobil marine oils, call 1-800-662-4525. If we can't save you money we don't deserve your business.